Extraordinary Dogs: Why a dog is great for your health! We may want to keep fit but are often low on motivation. The solution - a personal trainer - but not be the human version! Dog owners get more exercise walking their pet than someone with a gym membership. Walking a dog can beat going to a gym - it gives you 8 hours of exercise a week - be a constant companion, a great socialiser and someone who will listen to every word you say! In a bid to curb declining levels of physical activity in both people and their pets, RSPCA Australia and the National Heart Foundation of Australia have teamed up to encourage Australian pet owners to become more active to improve their health and that of their pets. Physical inactivity ranks second only to tobacco smoking in terms of the burden of disease in Australia. It accounts for 6% (second highest burden for men) of the total burden of disease and injury among males and 8% among females (highest burden for women). The annual direct health care cost attributable to physical inactivity is estimated to be around $377 million and physical inactivity is associated with about 8,000 preventable deaths each year in Australia. Furthermore, an RSPCA study in 2000 involving veterinary practices from across Australia found that 41% of dogs surveyed and 33% of cats were overweight or obese - confirming the widely held view that the prevalence of overweight pets in Australia is alarmingly high. Obesity in pets is associated with a number of medical complaints including osteoarthritis, cardiovascular disease, liver disease and insulin resistance. Reduced risk of diseases such as cardiovascular disease, type II diabetes, osteoporosis and colon cancer, as well as reduced risk of obesity & injury. Regular exercise is vitally important for pets too and is an essential part of being a responsible pet owner. 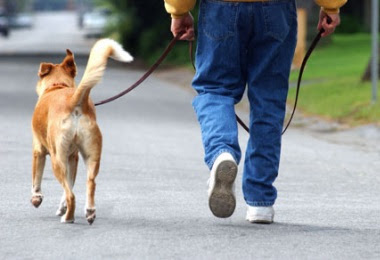 Regular walking can help your dog maintain a healthy weight, build endurance and muscle tone. Furthermore, a regular walk can make a dog very happy - they love to check out the sights and smells and will really look forward to spending this time with you. A dog that doesn’t receive sufficient exercise can easily become bored or destructive. Exercising with your pet can be great fun and helpful for you as well. There’s nothing like an exercise partner who’s waiting by the door with a wagging tail to keep you motivated! The National Physical Activity Guidelines for Australians released in 1999, which is supported by the Heart Foundation, recommend that at least 30 minutes of physical activity of moderate intensity be accumulated on most, if not all, days of the week to obtain a health benefit for humans. Examples of moderate physical activities include swimming, tennis, cycling or brisk walking. Most dogs need to be walked at least once each day, though some breeds - particularly larger or more active types - may require more. The breed of dog you have, as well as its level of fitness, will also determine how long and how vigorous your walk should be. Walking has been identified as the most popular physical activity option in Australia and of those people who are active; it is the most prevalent type of physical activity. Walking is a behaviour that is popular throughout Australia across cultures and across the age range. Almost anyone can begin to walk for fitness – it’s fun, convenient and not overly stressful on your body. Even though participation in physical activity is declining, research has demonstrated that there has been an increase in the number of people walking among all age groups since 1989, with 55% of Australians walking regularly (up by 10% in 5 years). A saving of $8 million in direct measurable health costs each year, with even larger savings in indirect costs. 122 fewer heart disease deaths each year. A marked reduction in the incidence of heart disease. Just as humans shouldn’t start a vigorous exercise program without consulting their doctor, your dog should be checked out by a veterinarian before starting a regular walking or jogging programme - especially if it hasn’t been exercising regularly for a while. Don’t overdo it - give yourself and your dog time to build up your fitness gradually and have a goal in mind to work towards. For example, if you get started now, you’ll be in great shape to strut your stuff at the RSPCA MillionPaws Walk next May. www.millionpawswalk.com.au. Be wary of taking very young dogs or puppies out for fast walks - their bones need time to develop. Wait until your dog is at least a year old, or 18 months for larger breeds, and in the meantime they can keep fit by running around the backyard and playing! Make sure your dog is protected from the summer heat – try to walk during the coolest part of the day and make sure your dog has access to plenty of fresh cool water. Remember, always keep your dog on a leash in public, unless you’re in a designated off-leash area, and make sure it is wearing an ID tag and is micro-chipped. For pets, just as for humans, regular exercise should be part of a total approach to leading a healthier lifestyle, of which diet is another important element. Be careful to feed your dog a balanced and nutritious diet, don’t overfeed and seek your vet’s advice if you’re unsure. The Million Paws Walk is the RSPCA's major national fundraiser. Every year, over 80,000 people and 45,000 pets hit the pavement to raise much needed funds for the RSPCA. Visit the website to find out more information and to register online www.rspca.org.au or www.millionpawswalk.com.au. The growing popularity of trampolines worldwide has led to an increased number of accidents, as well. The truth is that trampolines are indeed fun, bouncy things that can bring your children a lot of joy, but the problem is that many people don't take the issue of safety into account, especially when buying a cheaper model, and this can be dangerous, particularly in the case of younger children. Healthcare reform is an important issue in the U.S. Mental health care is a CBD for anxiety and depression component, providing specialized care for patients with mental illnesses and substance abuse disorders.